Our proven range of specialist systems designed to meet the requirements of HM Prison Service, the Police and similar organisations. All of our custodial products conform to the relevant MoJ / Home Office / NOMS / HM Prison Service standards. Cost‑effective, BS compliant solutions for disabled toilet and emergency assistance alarms, disabled refuge and fire telephone EVC, audiovisual intercom and other communication systems. 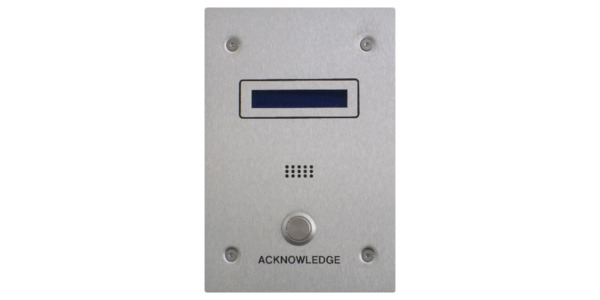 Vandal resistant, BS 5839‑9:2011 compliant, disabled refuge EVC system. Offers cost effective solutions for shops, offices, hotels and other public spaces. Range of outstation designs with induction loops, photoluminescent and Braille annotation. Can be combined with fire telephone, emergency assistance alarms, etc. Tough, proven, reliable, vandal resistant disabled toilet and emergency assistance alarm. Single and multiple toilet systems with options for local and site‑wide monitoring. Interfaces for third‑party equipment. Range of standard and custom finishes. Conforms to the requirements of BS 8300‑2:2018. Our new 3rd generation network alarm system has been designed for network operation with a range of standard features, making the system more flexible, easier to install, maintain and operate. Enhanced fault monitoring comes as standard ‑ helping maintain high availability ‑ making our system the alarm you can rely on. Additional functionality comes as standard ‑ emergency assistance, duress, affray, panic, occupancy, nurse call alarms. No compromise comes as standard ‑ all of our networked alarm systems offer battery backed stand‑alone operation with local beacon, sounder and acknowledge buttons. Our alarms will work when the network or mains supply is interrupted. Our latest products can be supplied with SteriTouch® antimicrobial finishes - offering greater protection to staff and public. Antimicrobial compounds inhibit the growth of pathogens reducing the risk of infection, mould and bioslime - making our equipment even more suitable for use in sensitive locations e.g. care homes and hospitals. Using antimicrobial compounds to reduce the spread of infection in well-used public facilities e.g. toilets in shopping centres, railway stations, etc. can also have significant health benefits for the general public. Antimicrobial finishes are available for disabled toilet / emergency assistance alarms, personal attack alarms, intelligent affray systems, custody suite security systems and custodial security systems. Our enhanced disabled toilet alarm system can help you meet The Department for Communities and Local Government 9 March 2016 statutory guidance APPROVED DOCUMENT M VOLUME 2 for toilet, bedroom and other emergency assistance alarms. Our large range of disabled toilet / emergency assistance alarm equipment could be the perfect solution for you. Folknoll - meeting standards since 1975. New, high‑quality, chrome finish, water‑resistant, pneumatic, alarm call point. Ideal for use in showers, saunas, swimming pools, etc. The latest product in our ever‑growing range of cost‑effective BS 8300 compliant disabled toilet / emergency assistance equipment. We supply tough, vandal resistant single and multiple toilet systems with local and remote monitoring, designed for public places. All of our systems are tailored for your site from our range of high‑quality units. Our latest top‑end systems offer fault monitoring, event log audit trails, PC operator workstations, etc.